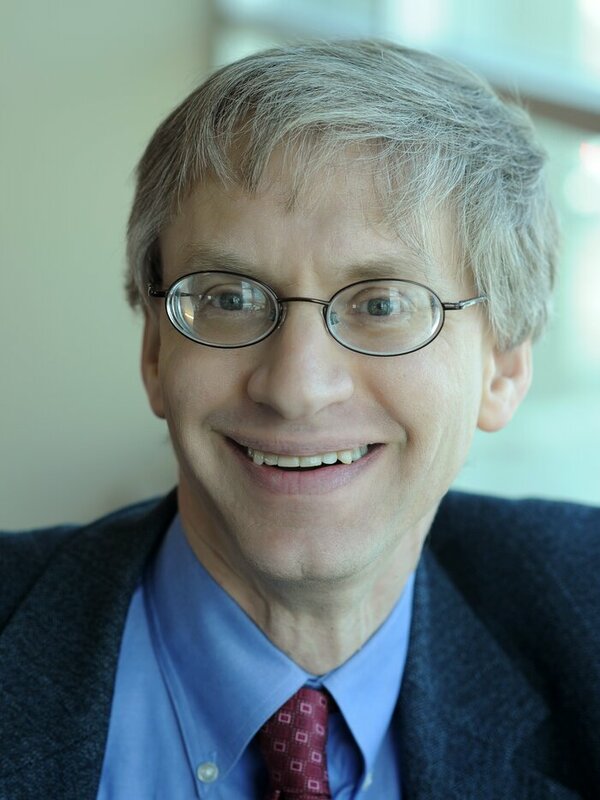 A couple of years ago, University of Chicago professor Harold Pollack did an online video chat with personal finance writer Helaine Olen. The topic was how regular people get steered into bad investments by financial advisers. 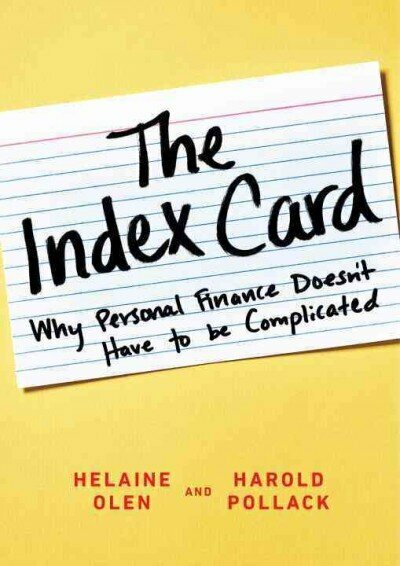 Pollack said that the best personal finance advice "can fit on a 3-by-5 index card, and is available for free in the library — so if you&apos;re paying someone for advice, almost by definition, you&apos;re probably getting the wrong advice, because the correct advice is so straightforward." Join NPR&apos;s Your Money And Your Life Facebook group for more personal finance know-how. After they posted the video, the emails started pouring in — people wanted to know, where could they get this index card? What was this fantastic yet simple advice for managing their money? "Since I was speaking metaphorically, I was kind of stuck," Pollack says. "But I just took one of my daughter&apos;s index cards and I scribbled a bunch of principles, and I took a picture with my iPhone and I posted it on the Web." The index card got into Google&apos;s news results. It got into big newspapers. Famous economists tweeted about it. Self-help sites like Lifehacker mentioned it. In short, it went viral. The ideas on the index card weren&apos;t new — pay off your credit cards, invest in low-fee index funds, etc. — but there clearly was an appetite for this simple, good financial advice. So Pollack and Olen have now written a book (The Index Card) about it. Which — if the whole point is that this stuff is so simple you can fit it on an index card — might seem counterintuitive. "Well, I would just say that, why do we need an entire Bible really? We have the Ten Commandments and the Sermon on the Mount," Pollack says — adding that he does not mean to elevate his work to the level of scripture. The point is, sometimes you need more than the basics. "We all know, for example, in tennis, how do you win a tennis match?" Pollack says. "You hit the ball low. I could tell you that, but I haven&apos;t told you how to do that." And this actually gets at what many economists say is the reality with financial advice: Most of it is pretty simple. 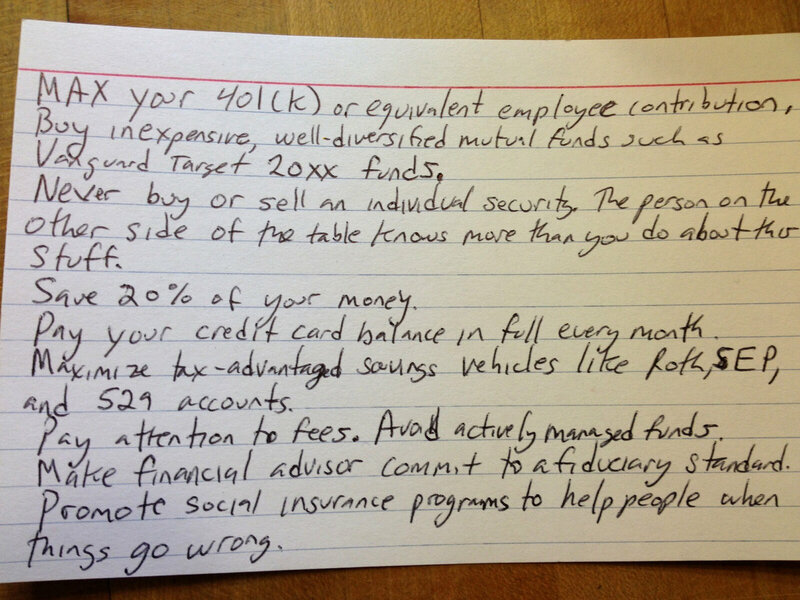 The rules on Pollack&apos;s index card start with saving 10 to 20 percent of your income, maxing out your 401(k), not buying or selling individual stocks. But there also are more subtle points of advice — including whom you should bring on to help advise you. 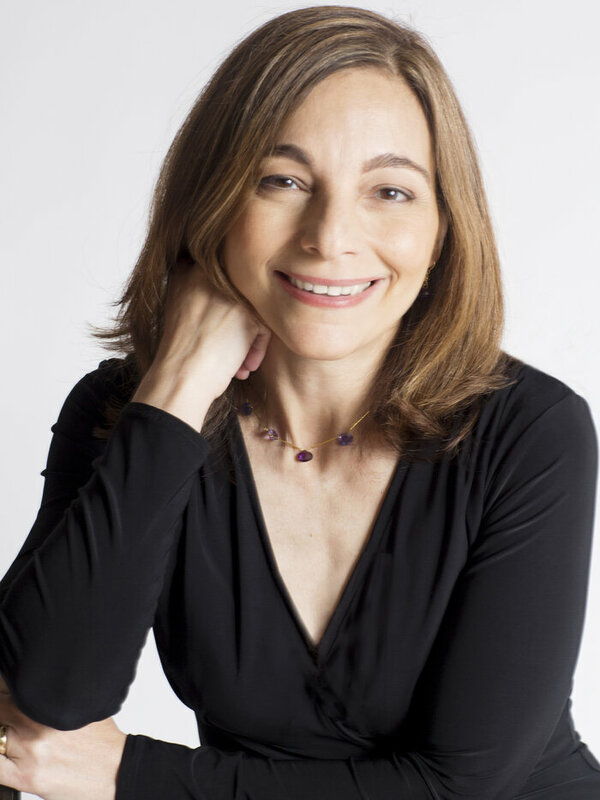 "I&apos;m struck by the number of my friends and relatives who believe that their financial adviser is free, and say things — &apos;Oh, the funds pay for that,&apos; " Pollack says. "I don&apos;t know about you, but I generally don&apos;t work for free. So you want to understand, how is this person being paid?" Rule No. 6 on the index card is to make your financial adviser commit to the Fiduciary Standard — meaning that your interests come first. But the regulations around that can be mushy. Some economists say an easier approach is to use what&apos;s called a "fee-only" adviser, who can&apos;t take commissions for steering you into overpriced mutual funds. If you have an adviser, Pollack and Olen say you need to talk about this stuff. "It shouldn&apos;t be awkward — if it&apos;s awkward, there&apos;s already a problem," Olen says. "If somebody is making you feel guilty for asking questions, you shouldn&apos;t be there — period, full stop — no matter what standard they&apos;re working to." That said, both Pollack and Olen say a good, reasonably priced financial adviser can sometimes be helpful — especially when life gets too complicated to fit on an index card.